Mercury Living Presence is special in many ways - an American company, from the heyday of classical recording in the U.S. that reproduced some of the most sonically realistic recordings at the dawn of the stereo era. Precious few stereo LPs were pressed when these recordings were issued, and they became some of the rarest, most collectible classical discs ever. 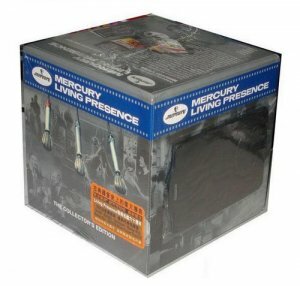 Mercury Living Presence continues to enjoy a special reputation as one of the most enterprising, prestigious and sonically-spectacular labels in the history of classical recording. Some of these recording have been available on CD and on SACD. However, many are now deleted and only available 2nd-hand or through auction sellers at premium prices. This 50-album Box Set (plus bonus interview CD with Wilma Cozart Fine, Mercury s producer) affords collectors an opportunity to acquire 50 classic recordings at a terrific price, in a box which may well become collectible itself. Liszt: Piano Concertos 1 & 2, etc. Rachmaninov: Piano Concerto No.1, etc. Brahms: Piano Concerto No.2, etc. Bach: 6 Suites for unaccompanied cello, etc. Stravinsky: 3 Movements from Petrouchka, etc. Stravinsky: L'Oiseau de feu - complete; Feu d'artifice; Chant du rossignol, etc. Boccherini, Vivaldi, Corelli, Locatelli, Valentini, etc.